Stock markets have been touching new highs over past six months on improved sentiment, but macro concerns have kept bond yields high.Historically, cheap money, or low interest rates, has been a pre-condition for a bull run in equities. Given that interest rates in India are at multi-year highs, the question is who is right -the bond investor or the equity investor? The story of the last six months in these two markets has been different. The benchmark Sensex has rallied over 20%, but the bond yields have continued to remain high above 8.6% in the period, suggesting the equity rally is purely driven by sentiment, and not by economic fundamentals. At the beginning of the 2004-2007 bull run, the 10-year government bond yields were at 5.28%, which increased to 7.8% towards end 2007 (the Sensex rose from 4800 to 20000 during the period). The bond yield fell to 5.26% in December 2008 as the Reserve Bank of India joined global central banks in lowering interest rates to prevent a worldwide collapse of economies after Lehman Brothers went bankrupt. 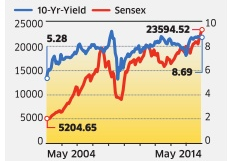 That formed the base for another rally from 2009 to 2011; the Sensex rose from 8600 to 20500 in the period.The benchmark bond yields are now at 8.69%, close to a five-year high. It is a signal that bond investors are more skeptical than stock investors about the economy turning around under the Narendra Modi-led NDA government.They may be right given the government borrowing, fiscal deficit and inflation, which shows little signs of easing. These will keep the interest rates high and, hence, the cost of borrowing for corporates will remain high. In the near-term, higher inflation will keep raw material prices high and higher borrowing costs will put pressure on profitability. Currently, the market valuations are already discounting two years’ future earnings, which may well indicate some short-term pain. Given the steep valuations, the equity market will consolidate for the next few months until there is improvement in the macro environment. Once the macro factors show signs of improvement in the next few months, bond yields may fall and set off a rally backed by fundamentals. Till then, its debatable whose right -equity or bond investors?But they both can’t be right.